Any time a recipe starts with the phrase “three ingredients”, it makes my heart go pitter patter. I love cooking but I don’t always have the time to make the recipes I want because of the lengthy list of ingredients. 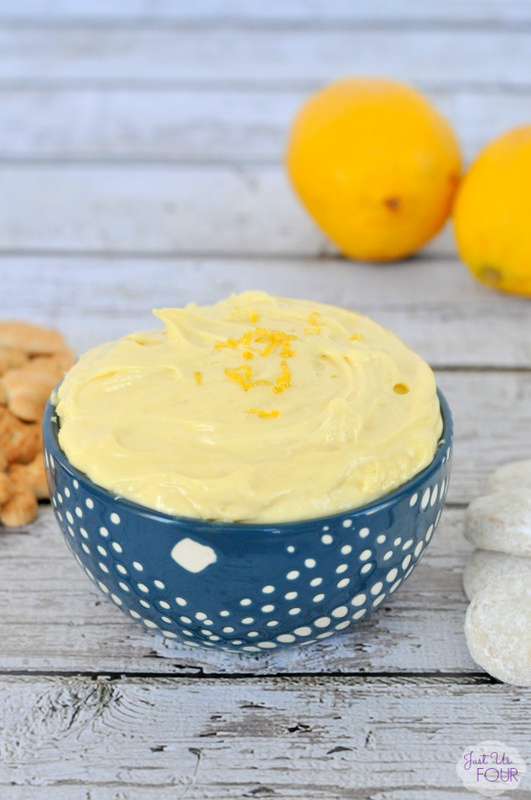 Having an arsenal of recipes that don’t require many ingredients, like three ingredient TWIX dip, carrot cake dip or this lemon cake batter dip, makes it easy for me to still make something even when I am short on time. 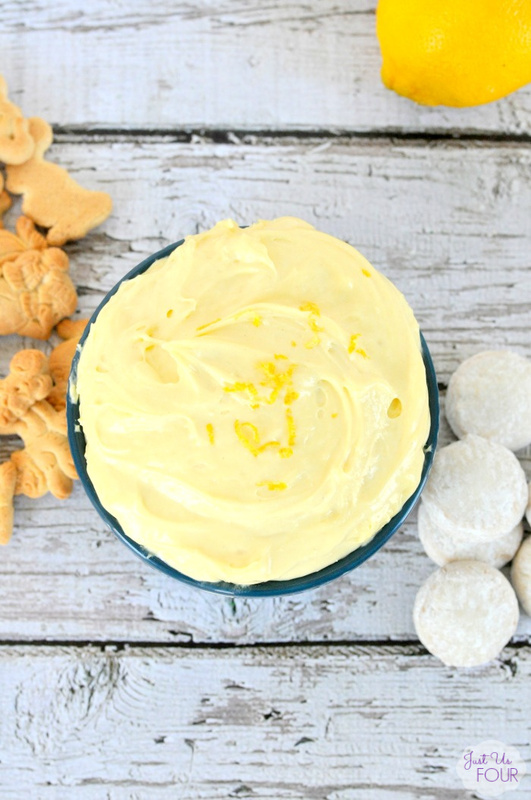 This three ingredient lemon cake batter dip is just the hit of spring we need around here. We’ve been jumping back and forth between warm, Spring days and cold, Winter-like days so I need as much sunshine as I can get. Plus, you can make this ahead so it is perfect for any upcoming picnic or party. 1) Place cream cheese in the bowl of a food processor* or mixer and beat until smooth. Add in 1/4 cup cool whip and lemon cake mix. Pulse or mix until smooth. Fold in remaining cool whip. Refrigerate for at least one hour before serving. 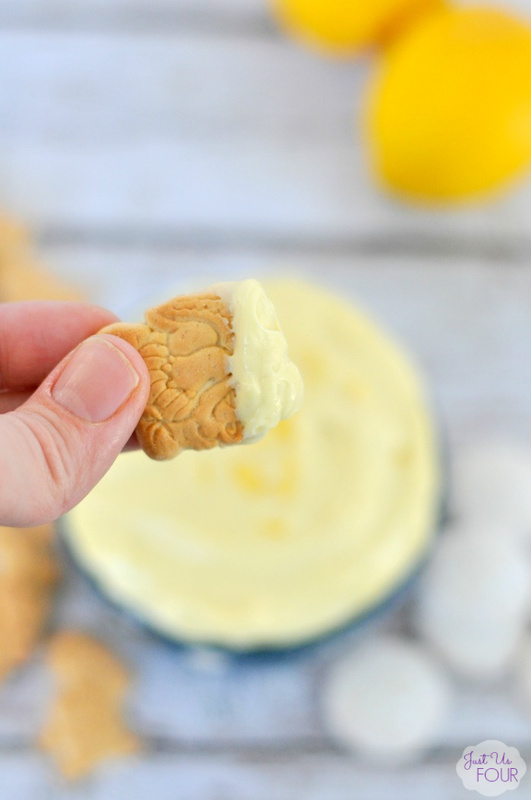 I serve this with little animal crackers and lemon drop cookies. Both work great with the balanced sweetness of the dip. You can top it with a little lemon zest for added fun if you want but that will mean you have to pick up a lemon. However you serve it, I guarantee everyone will be asking for seconds after they try it. *I use the food processor because the bowl is smaller so it takes up less space in the dishwasher. Feel free to use the mixer if you prefer. What are some of your favorite easy dessert recipes? Place cream cheese in the bowl of a food processor or mixer and beat until smooth. Add in 1/4 cup cool whip and lemon cake mix. Pulse or mix until smooth. Fold in remaining cool whip. Refrigerate for at least one hour before serving. Oh man this looks incredible! Im on a strict diet otherwise I would be all over some of this dip! Love this easy recipe. I know what I will be making for my next party! Thanks so much for sharing at the Thursday Favorite Things Blog Hop! This looks amazing! If only I could reach through the screen… Pinning this one to try very soon!